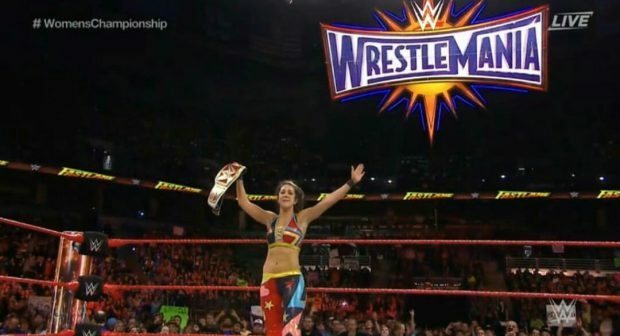 Tonight at Fastlane, Charlotte Flair‘s victories of PPV streak came to an end as Bayley successfully defended her Raw Women’s Championship. Prior to the match, Charlotte had sent her protégé Dana Brooke to the back, a nudge to Bayley after the champion had challenged Charlotte to take her one-on-one in an interview that took place earlier in the night. Once the match started, both women went back and worth competing for control of the match. When the action spilled to the outside, Bayley hurricanrana from the ring apron, then headed up to the top rope for a cross body, leading to a two count over the challenger. Charlotte began a comeback with by using her legs to trap Bayley into a headlock and then thrusting the champion’s head onto the mat. Charlotte would follow up with her signature top rope moonsault and running Senton but it wasn’t enough to put Bayley away. Bayley began another combat by fighting off Chalotte with a series of chops to the chest, a second hurricanrana and top rope elbow drop. When Bayley went high risk again, she was knocked off by Charlotte, who landed in a Natural Selection in process, nearly putting away Bayley for the three count. In the end, it was an interfering Sasha Banks that would seal Charlotte’s fate. The Boss ran down to the ring, distracting Charlotte on the outside and allowing Bayley to hit a Bayley-to-Belly from the outside floors. When Bayley tossed Charlotte back in the ring, Charlotte played possum and nearly stole another win by pinning Bayley with a handful of Bayley’s tights. Sasha would run back out to alert the acting referee of Charlotte’s dirty tactics, causing another distraction that allowed Bayley to hit a second Bayley-to-Belly to retain her title. The match also marks the end Charlotte’s PPV streak victories at in single matches at 16.